Using a unique barrel ageing process developed by the brewing team at Innis & Gunn, Kindred Spirits is matured using the finest triple distilled, triple blend Irish whiskey barrels from Tullamore D.E.W. to create a smooth and delicious Scottish Stout that is greater than the sum of its parts. 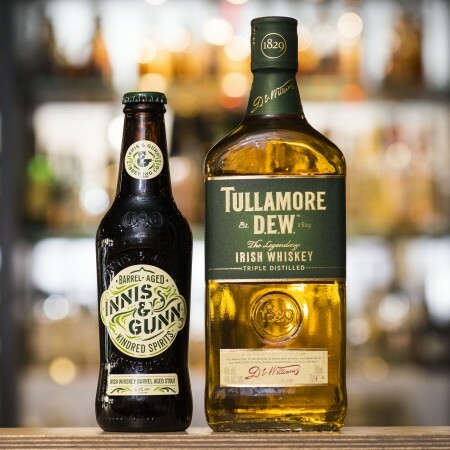 The result is a one of a kind craft stout – a perfect pairing of the character of Innis & Gunn’s rich flavour packed beer, and the sweet, spicy, smooth taste of Tullamore D.E.W., with notes of dark chocolate and coffee alongside hints of vanilla and oak. Kindred Spirits will be available for a limited time in 330 ml bottles at liquor retailers in Ontario, Alberta, British Columbia, Manitoba, Saskatchewan, New Brunswick, Newfoundland, and Nova Scotia. For details on availability and pricing, check with local retailers.